The Snore No More Goodnight anti-snoring ring is a ring that claims to help you quit snoring at night. The manufacturer claims the ring can help you to quit snoring because the ring uses the “tested principles of acupressure.” The ring claims to apply light pressure to not one, but two specific points on your little finger. But, let’s get real: wearing something on your finger in order to stop snoring sounds easy, too easy, frankly. If you’re like most snorers, you snore because your airways are not opening up properly. So, er, there’s quite a bit of “faith” involved in this device, to say the least. The price of the Snore No More Goodnight anti-snoring ring is $39.95. Besides the price of the ring, you also need to pay a shipping and handling fee of $4.95. All major credit cards (MasterCard, Visa, Discover, and American Express) and PayPal are all accepted as terms of payment. The company claims to offer a 100% money back guarantee. This is good, as you should expect to return the product, because the anti-snoring ring will probably to definitely not work to keep you from snoring at night. 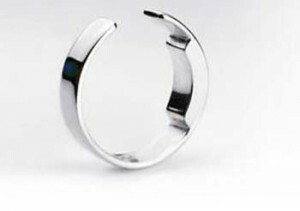 The Snore No More Good Night anti-snoring rings are somewhat stylish, I suppose, if you’re into pinky rings. That is about the only good thing about these rings. I’m not sure how many ways I can express to you that these rings are going to do nothing for you in regards to your snoring problem. The Snore No More Good Night anti-snoring ring is adjustable to comfortably fit your finger. The ring comes in three sizes of small, medium and large. The sizing chart of the rings is small (1-1/2' to 2-1/8'), medium (2' to 2-1/2') and large (2-1/3' to 2-3/4'). The manufacturers of the Snore No More Good Night say that you should wear your ring every night; start at least 30 minutes before you sleep. They also note that you should not wear the ring for more than 12 hours at a time. Er, OK. Sounds good. They say that in many cases, the ring can work the first night, but it may take three to four days for your body to get used to wearing it. You can easily get used to wearing the ring but you are not going to notice any type of improvement when wearing the ring. Er, maybe your finger will be warmer? Hate to repeat myself, but this thing ain’t doing much for me. The Snore No More Goodnight anti-snoring ring is completely safe to wear at night (I mean, it’s a ring!). It does not matter how long you wear the ring. A ring is just a ring. You might in fact be better off just wearing any of your other rings, rather than wearing this ring. You can wear the ring all you want, but it will do nothing for you except remind you that you’ve been sucked into a rather odd scam. The Snore No More Good Night anti-snoring ring features no side effects when using the product. Er, perhaps “Buyers Remorse” is one of them, but that’s about the extent of it. Who Can Wear The Snore No More Good Night Ring? The Snore No More Good Night anti-snoring ring is made for adults only. The rings are not made for children. The rings are also not safe for children because they may put the ring in their mouth. They may also cause children to believe that certain products may help them when in fact they do not. Uh, something tells me that last statement also applies to adults. Do not waste your money by buying a Snore No More Good Night anti-snoring ring. If you believe that a ring is going to help you quit snoring at night, then I can’t really help you here. If you have purchased a ring from Snore No More, you need to get your money back from them right away. It’s really a decent idea. There are many mouthpiece products that are out there to help you eliminate snoring, but an anti-snoring ring is not something that is going to help you at all. You could probably wear a garbage can lid on your head and get similar results. There is no way that this anti-snoring ring can be recommended to be used. There is no proof that the ring works and many people have used it with no luck. However, if you’d like to check out the product’s Amazon page, click here. How great it would be if there was a ring that you could wear on your small finger at night that would prevent you from snoring? This may be true in some magical land, but in the real world, there is not a ring that is going to keep you from sawing those snoring logs. Have you used this ring with positive results? What drugs are you on and where can we get them?